Federal College of Education (Special), Oyo Pre-NCE admission form for the 2016/2017 academic session is now on sale. Applications are invited from suitably qualified candidates for admission into the Pre-NCE programme of Federal College of Education (Special), Oyo for the 2016/2017 academic session. 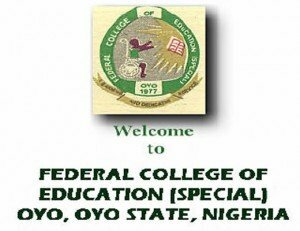 FCE (Special) Oyo Pre-NCE Admission Requirements. FCE (Special) Oyo Pre-NCE Courses Available. How to Apply for FCE (Special) Oyo Pre-NCE Admission. v. Print-out the Online Application Form to ascertain successful registration.